Therefore, in August 1990, the group issued a 400-page report titled "Transition to the Market". It was based on the earlier "400 Days Project" prepared by Yavlinsky and became known colloquially as the "500 Days Program" as it intended to create the groundwork for a modern market economy in 500 days. The report called for creation of a competitive market economy, mass privatization, prices determined by the market, integration with the world economic system, a large transfer of power from the Union government to the Republics, and many other radical reforms. The Gorbachev Peace Egg is a Fabergé egg by Fabergé workmaster Victor Mayer. In 1991 Herbert Mohr-Mayer gave the Gorbachev Peace Egg to Mikhail Gorbachev, president of the former Soviet Union. It was given as a tribute to the way in which Gorbachev had succeeded in reducing tensions between East and West. Mikhail Gorbachev donated this Fabergé egg as an Easter present to the Kremlin Museum in Moscow. The egg is made of 18Kt yellow gold and covered with transparent green vitreous enamel. The upper half of the egg opens up and reveals a golden dove. Green Cross International is an environmentalist organization founded by former Soviet leader Mikhail Gorbachev in 1993, building upon the work started by the 1992 Earth Summit in Rio de Janeiro, Brazil. The Independent Democratic Party of Russia (Russian: Независимая демократическая партия России) was the proposed name of a liberal party that was announced in late September 2008 to be founded by the former General Secretary of the Soviet Union, Mikhail Gorbachev, and State Duma deputy of Fair Russia, Alexander Lebedev. The Union of Social Democrats, led by Mikhail Gorbachev, is said to be its main base. Lebedev also stressed that the "party will press for legal and economic reform and promote the growth of independent media" as well as "less state capitalism", a reform of the justice system, and a stronger role of the parliament. At some point between 2014 and 2016, the website associated with the proposed party went offline. Khozraschyot (Russian: хозрасчёт, IPA: [ˌxozrɐˈɕːɵt]; short for хозяйственный расчёт khozyaystvennyy raschyot, "economic accounting") was an attempt to simulate the capitalist concepts of profit and profit center into the planned economy of the Soviet Union. khozraschyot is a method of the planned running of an economic unit (i.e., of a business, in Western terms) based on the confrontation of the expenses incurred in production with the production output, on the compensation of expenses with the income. Meeting Gorbachev is a 2018 biographical documentary film directed by Werner Herzog and André Singer about the life of Mikhail Gorbachev, the eighth and last leader of the Soviet Union. The film features three interviews between Herzog and Gorbachev, conducted over the span of six months, and had its world premiere at the Telluride Film Festival on September 1, 2018. Raisa Maximovna Gorbacheva (Russian: Раи́са Макси́мовна Горбачёва tr. Raisa Maksimovna Gorbachyova, née Titarenko, Титаре́нко; 5 January 1932 – 20 September 1999) was a Russian activist who was the wife of Soviet leader Mikhail Gorbachev. She raised funds for the preservation of Russian cultural heritage, fostering of new talent, and treatment programs for children's blood cancer. "Sinatra Doctrine" was the name that the Soviet government of Mikhail Gorbachev used jokingly to describe its policy of allowing neighboring Warsaw Pact states to determine their own internal affairs. The name alluded to the song "My Way" popularized by Frank Sinatra—the Soviet Union was allowing these states to go their own way. 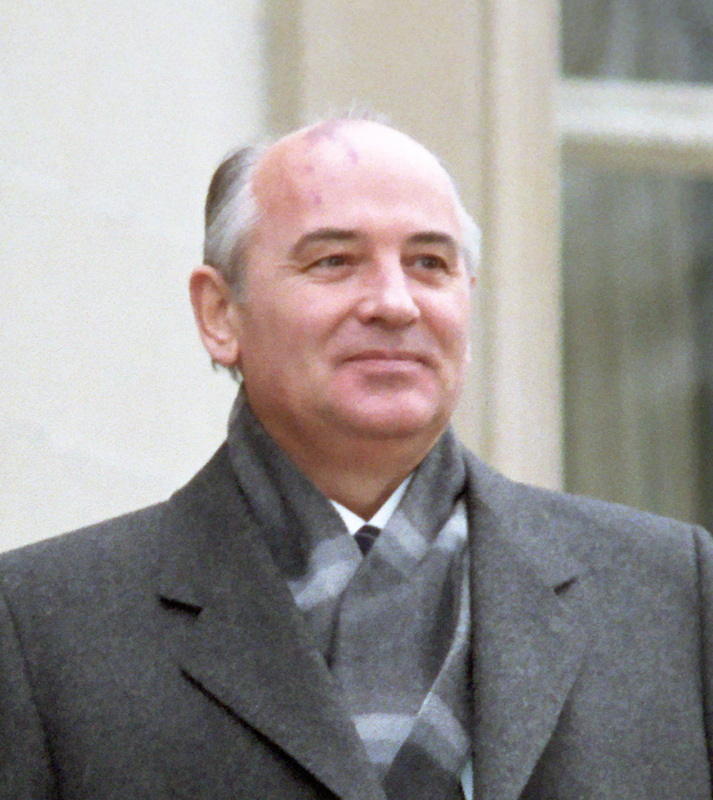 Its implementation was part of Gorbachev's doctrine of "new political thinking". The Social Democratic Party of Russia (Russian: Социал-демократическая партия России, Sotsial-demokraticheskaya partiya Rossii) was a political party founded in Russia by Mikhail Gorbachev on November 26, 2001. The first name of the party was Social Democratic Party of Russia (United). The Gorbachev Foundation (Russian: Горбачёв-Фонд, Gorbachyov-Fond) is a non-profit organization headquartered in Moscow, founded by the former Soviet leader Mikhail Gorbachev in December 1991 and began its work since January 1992. The foundation is active in researching the Perestroika era, current issues of Russian history and politics. It is financed by Mikhail Gorbachev and donations by people and companies.